Cellist Yo-Yo Ma reminds us of the universal ties that bind us in THE MUSIC OF STRANGERS: YO-YO MA AND THE SILK ROAD ENSEMBLE. Photo courtesy HBO. Neville shines a light on another unheralded corner of the music industry in The Music of Strangers: Yo-Yo Ma and the Silk Road Ensemble. Yo-Yo Ma has been showered with praise ever since he shared the stage as a child prodigy with the likes of Leonard Bernstein. But, in The Music of Strangers, the renowned cellist admits to struggling as an adult with his relevance as a musician. “I never committed to being a musician, I just fell into it, ” he says. Iranian kamancheh player and composer Kayhan Kalhor (on left) is featured in THE MUSIC OF STRANGERS. Photo courtesy HBO. Why did he gravitate to the cello in the first place and stick with it? Was he actually making a positive difference in the lives of his audience, and where would the next chapter of his storied life take him and why? Those questions seem to have been exacerbated by his unrelenting travel schedule and coincided with the arrival of the new millennium. Yo-Yo Ma’s search for purpose led him to pilot the Silk Road Ensemble project in the summer of 2000. He invited a “family” of musicians, singers, composers, storytellers and artists from around the world to meet and meld their talents and unique instruments at Tanglewood in the bucolic Berkshires. There they would introduce both a collective and individual repertoire, incorporating new and traditional music rooted in their unique cultures. “We started as a group of musicians getting together and seeing what might happen when strangers meet,” recalls Ma. Despite their language and cultural barriers, they clicked. Like the ancient traders who once traversed the “silk road” connecting Asia, Africa and Europe to sell their wares, members of the Silk Road Ensemble would soon travel the world together, revisiting and sharing their traditional musical and cultural roots. To date, their “bridge building” has not only positively impacted the lives of their fellow musicians and artists, but audiences totaling some two million people in 33 countries. The Silk Road Ensemble has also celebrated the universal power of music on six albums, one of which…this film’s companion album, Sing Me Home…won a Grammy in 2017 for Best World Music Album. 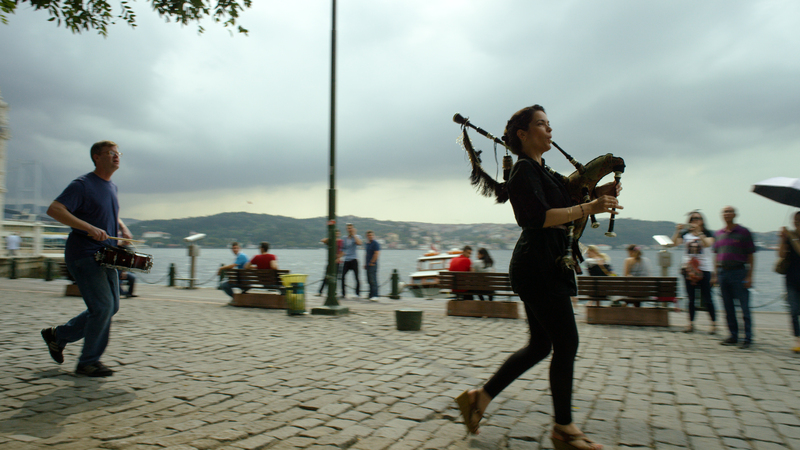 Spanish bagpiper Cristina Pato is a lively member of the Silk Road Ensemble. Photo courtesy HBO. Although Yo-Yo Ma plays a central role in The Music of Strangers, he shares the spotlight with several key members of the Ensemble: Syrian clarinet player and composer Kinan Azmeh; Chinese pipa player and composer Wu Man; Iranian kamancheh player and composer Kayhan Kalhor; and Spanish bagpiper, pianist and composer Cristina Pato. Their back stories, as musicians and artists born and raised in countries and regions upended by war, poverty, political revolution and cultural repression, are painful reminders of the dangers many individuals face on a daily basis as they lose loved ones in senseless bombing raids; dodge threats of being silenced, jailed or worse; and leave loved ones behind to seek asylum and assimilate in the U.S. and elsewhere. 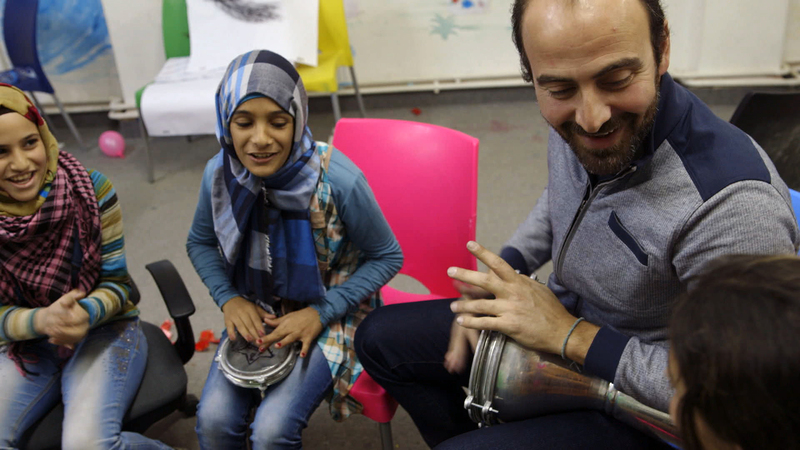 Syrian clarinet player and composer Kinan Azmeh visited Jordan to teach music to Syrian children in a refugee camp. Photo courtesy HBO. 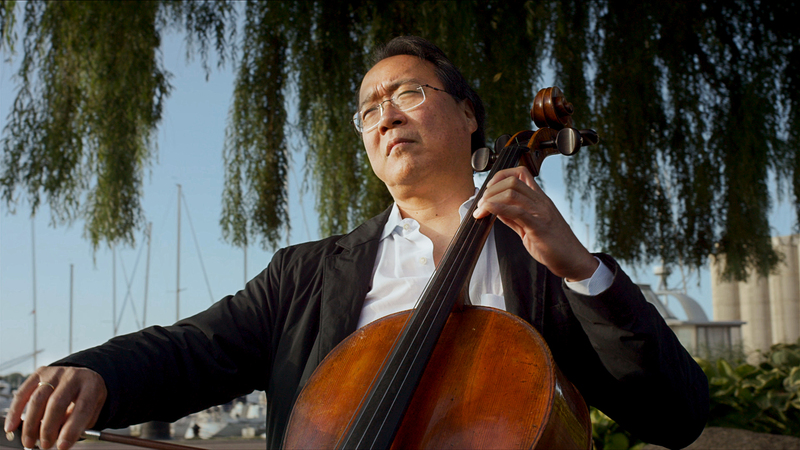 Evocative archival and recent film footage tracks Yo-Yo Ma and his collective colleagues from youthful promise through middle age in performance with the Ensemble. We are also privy to their return to homelands, in some cases warm and welcoming, and others decimated and dotted with grim refugee camps. The remarkable healing power of music is especially underscored for me in a vintage clip from Mister Rogers Neighborhood in which Fred Rogers asked a young Yo-Yo Ma if music brought him joy. Ma began playing a refrain from “Swan Lake,” as a broad smile stretched across Fred’s face. The film then cuts to a breathtaking contemporary performance of the same piece, featuring Ma and a dancer who has a soulful new take on the classic ballet. I urge you not to miss The Music of Strangers: Yo-Yo Ma and the Silk Road Ensemble. I guarantee that the fascinating, culturally diverse performers and their unique musical instruments will not only entertain and enrich you, but will remind you to cherish diversity and inclusion and the rich cultural heritage we often take for granted in the States. This entry was posted in Cable, Film, Music and tagged Cristina Pato, Diversity, HBO, Kayhan Kalhor, Kinan Azmeh, Mister Rogers Neighborhood, Morgan Neville, Music and Musicians, Silk Road Ensemble, The Music of Strangers Yo-Yo Ma and the Silk Road Ensemble, Wu Man, Yo-Yo Ma. Bookmark the permalink.